Abuse is Abuse: Quit trying to qualify it. The stats are that 1 out of every 3 women and 1 out of every 4 men are victims of some form of abuse by an intimate partner in their lifetime. That's crazy to think about, isn't it? In theory, that means one third of all the women and one fourth of all the men that you know have been abused. With how disgustingly common abuse is today, one would hope others would be familiar enough with it to know how to talk to an abuse survivor without causing further hurt and shame to them or that we would be equipped to help encourage a friend to leave an abusive relationship. But all too often, that's not the case. It's still "hush-hush" - a taboo subject. Most of us hardly know how to respond if someone just tells us they had a bad day. We feel uncomfortable and don't know what to say or how to comfort them. So hearing someone we know and love has been a victim of abuse?... well how do we even begin to handle that? What do we say? I'll get to that in a follow up post. But for now, let's talk about what NOT to say. I'm one of many who is a survivor of domestic abuse. For a lot of us, it takes a long time to wrestle with our story and accept that it was in fact an abusive relationship we were in. Abusive relationships are very manipulative by nature and have longterm affects on a person's psyche. So just getting enough healing to accept the reality of the situation and acknowledge the abuse is sometimes a very long process for survivors. "So... did he like, actually hit you?" That was one of the most common questions I was met with. You couldn't scream any louder how uneducated you are on the topic if you ever respond to a survivor with that kind of question. Physical violence is no better or no worse than sexual, emotional or verbal abuse. They are ALL abuse and all have a lasting impact on the brain. Assuming someone's situation wasn't "that bad" because they "didn't actually get hit" is foolish beyond measure and will do nothing to assist in helping your friend or loved one on their healing journey. 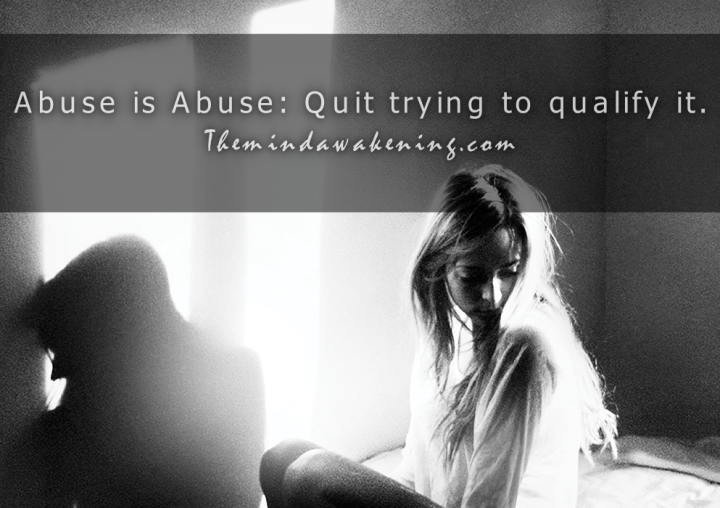 Abuse is a very diabolical and complex issue. Every victim of abuse has a different story. But at the end of the day what it boils down to is this: abuse is an act of mistreating or misusing another being, especially when done regularly or repeatedly. So when your friend tells you how her ex threw her against the wall because he was angry and it satisfied his demented, yet unmet need for control - that's clearly abuse. Or if someone you know has been sexually assaulted in any way, we obviously know that's abuse as well. But do you know what's also qualifies as abuse? Trying to leave a relationship and having a significant other manipulate you by saying "If you leave me, I will kill myself!" Having a significant other stalk you. Being yelled at and/or cussed out. Being isolated from friends and family. Having your car keys taken to prevent you from leaving. Being forced out of the house with no where to go. The abuser making threats of any kind - to take your car or other valuables, call the police on you, threatening to take your children, etc. Enduring mind games like being followed around the house for an hour to provoke you then recording your inevitable reaction to show his/her family and friends how "crazy" you are. Manipulation through "Triangulation": where other people who shouldn't be involved are brought into the situation in order to manipulate the victim to do such and such or respond a certain way because "otherwise, everyone will know you are crazy" or because "otherwise, I'll leave you for him/her." Stealing your things and pawning them for money. Refusing to inform you about your families financial situation or not giving you money to supply the home with the things the family needs. Blaming you for their problems. Destroying your reputation with lies through what is known as a "smear campaign," where the abuser convinces everyone they are the victim when in fact, they are not. All of that... yeah, that's abuse too. Not to mention, any of that done in the presence of children is, more often than not, legally acknowledged by the state as child abuse/neglect. Plus, there are countless other forms of abuse and ways it manifests. So please don't discount a survivors story if they actually find the courage in themselves to speak out and share about the abuse they endured, just because you don't see a bruise.